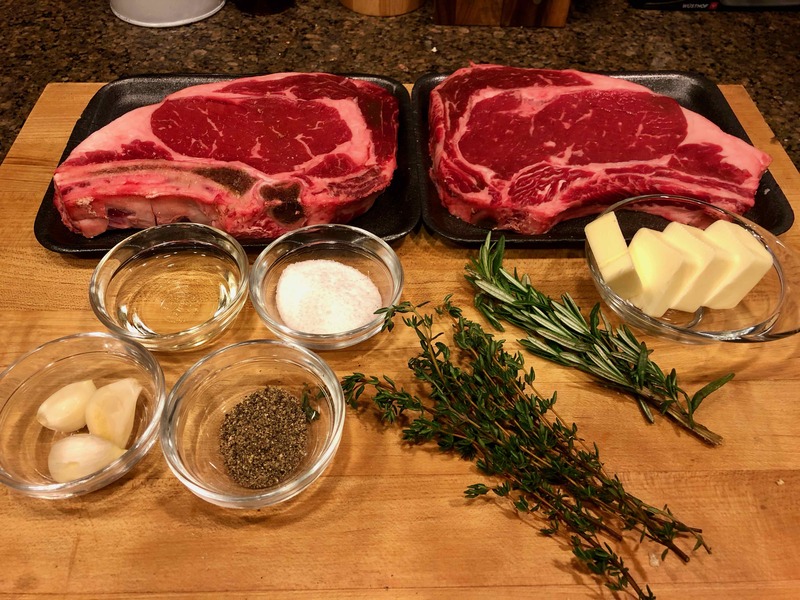 The recipe yielded two perfectly medium-rare steaks that, in addition to being well seared and juicy, were richly flavored by the herbs and garlic. 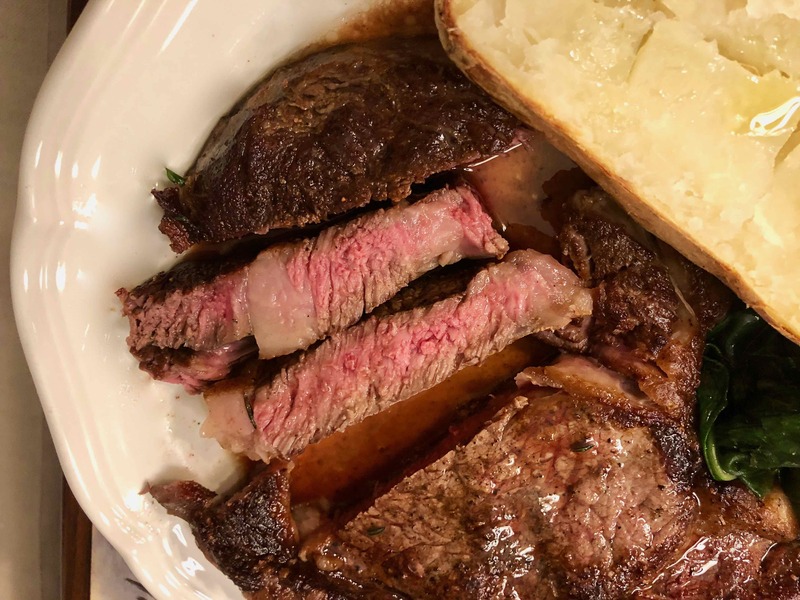 Moreover, although the recipe calls for quite a lot of butter, you only need a fraction of it to serve with the steaks. I must admit that I never make a sauce for steak and only season it with salt and freshly ground black pepper. At the table, I may drizzle the steak with my best extra-virgin olive oil. 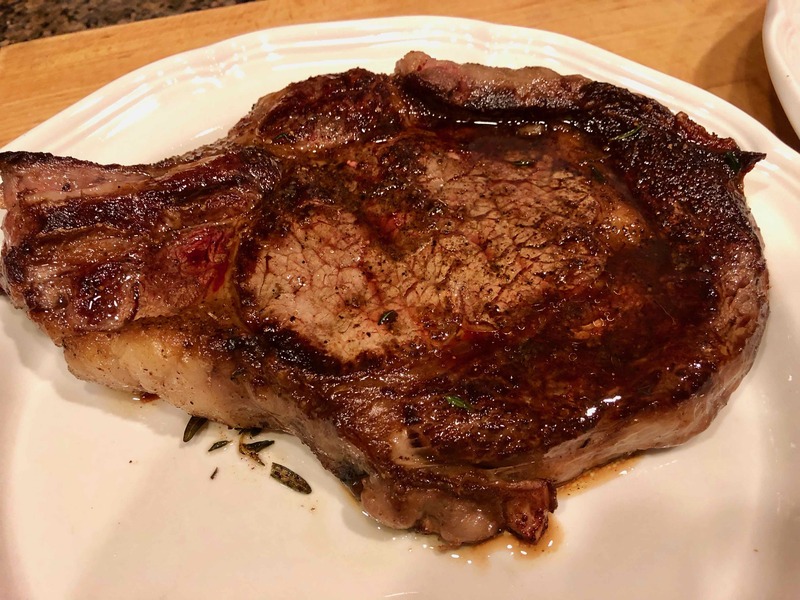 But what I especially like about this recipe is that the basting sauce doesn’t overwhelm the rib eyes’ rich beef flavor but rather provides the perfect complement for it. 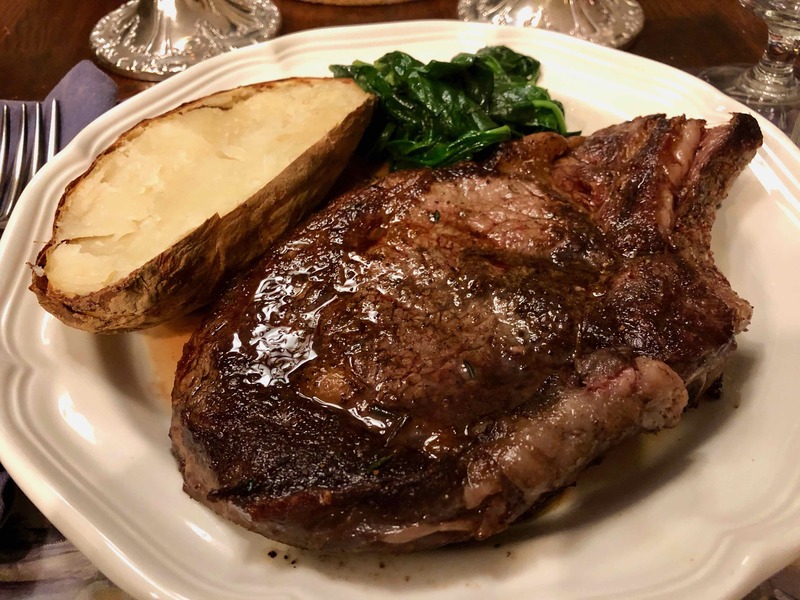 As is my custom, I served the steaks accompanied by a simple baked potato and spinach sautéed in garlic and oil. The perfect steak night dinner—even without New York strips. 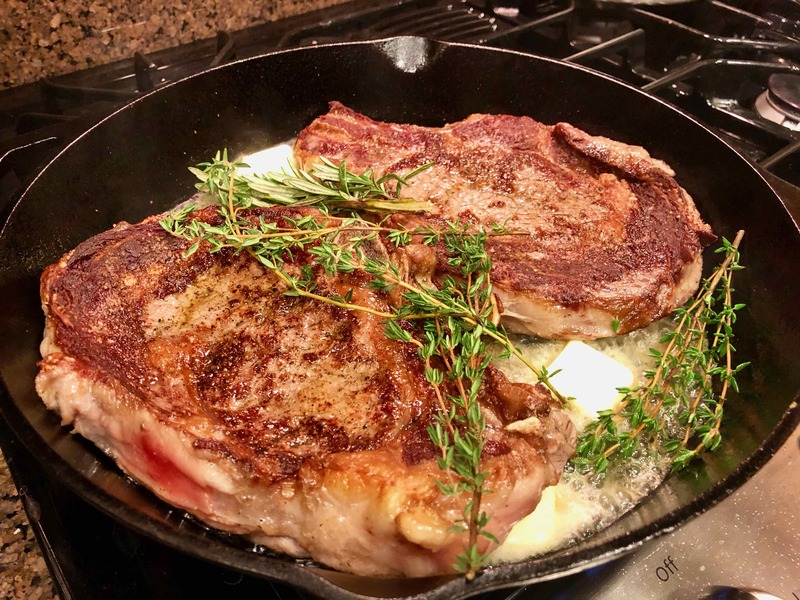 In a large cast-iron skillet, heat the canola oil until shimmering. Add the steaks and cook over high heat until crusty on the bottom, about 5 minutes. 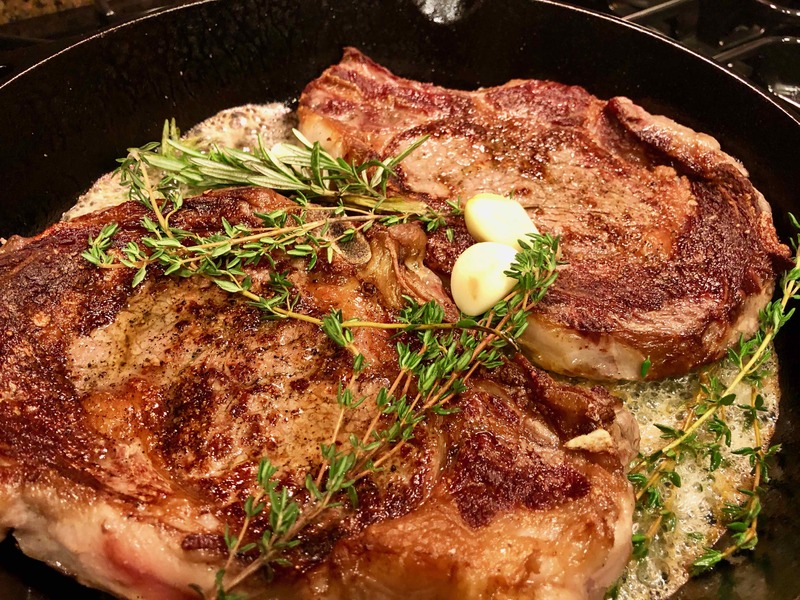 Turn the steaks and add the butter, thyme, garlic and rosemary to the skillet. 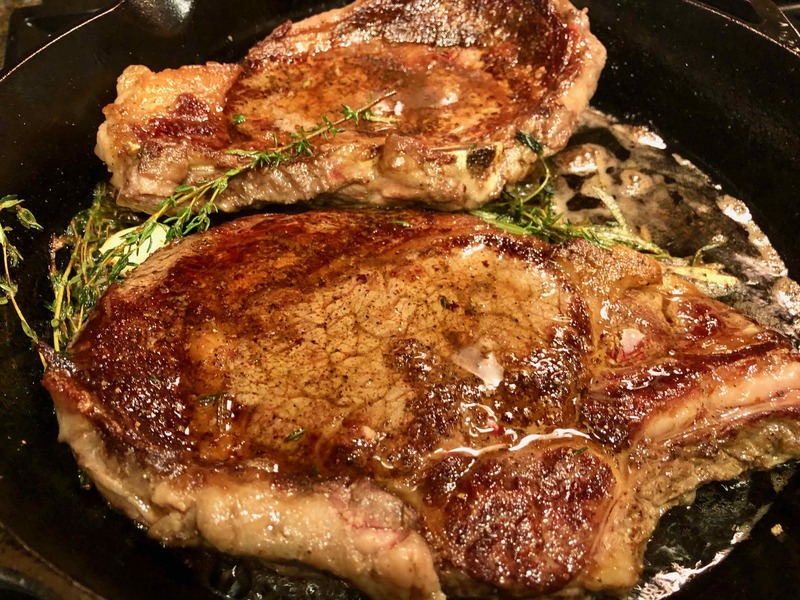 Cook over high heat, basting the steaks with the melted butter, garlic and herbs, until the steaks are medium-rare, 5 to 7 minutes longer. Transfer the steaks to a cutting board and let rest for 10 minutes. 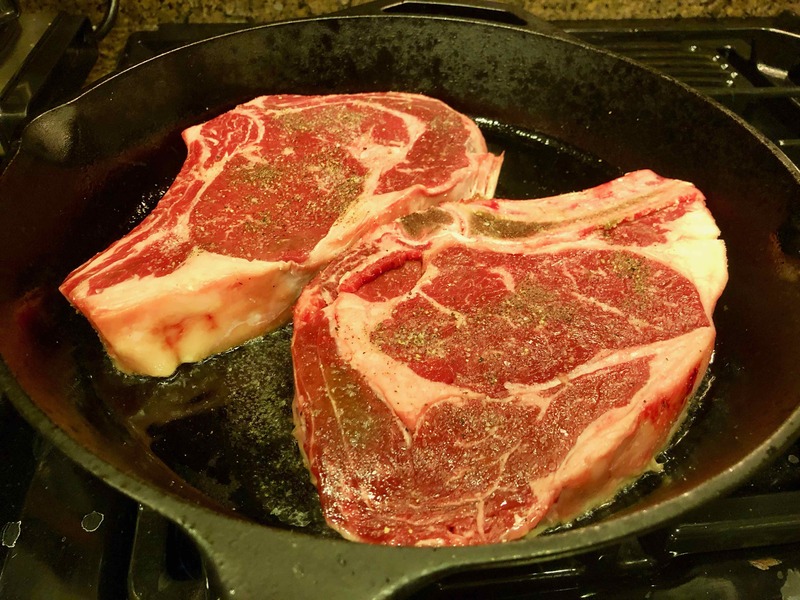 Cut the steaks off the bone, then slice the meat across the grain and serve. Wow, they look great! Enormous slabs of meat, though. If the two of you can each eat a whole steak that size at one sitting, I envy your capacity. Thanks, Diane. They were indeed quite large, but we limit ourselves to once a month for such an indulgence. Look wonderful. Seems to be an awful lot of meat! 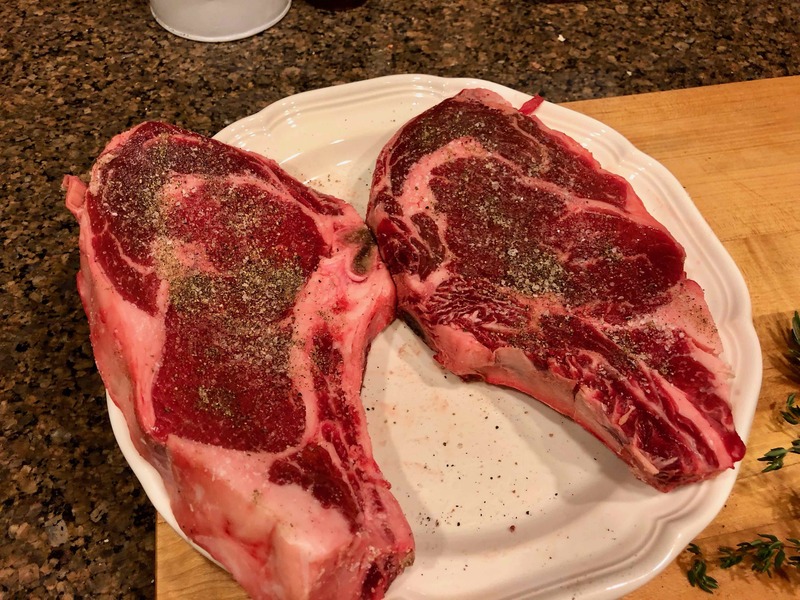 It is indeed a lot of meat; but they look even bigger because they are bone-in steaks. Oh, your bone on Ribeye looks marvelous raw and cooked. We don’t get that heavy marbled beef over this way and I must say I do miss it. A great cooking tutorial and a perfect meal in my mind. Thanks for sharing. Thanks for your kind words, Ron.